Choose your favorite mini charm pack, a Fat Quarter, and a zipper and you will be ready to make the sweetest pouch of them all! 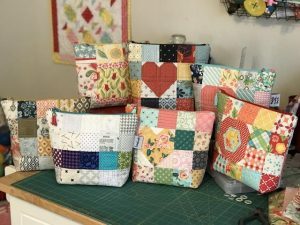 The Be Mine Heart Zipper Pouch has a contrasting bottom piece with added stabilizer for a pouch that sits up straight and says “Look at Me!” To make this pouch go a bit faster we will be using the Easy Piecing Grid from Ten Sisters. You will love just how speedy it goes together. The grid will be included in the kit. There are little amounts of interfacings, that’s why it’s offered in the kit.